Every day, we hear about horrible tragedies happening in the world, such as natural disasters and humanitarian crises impacting the lives of many families. But to many, it’s all a blur. These horrific things are just another far-away problem for someone else to solve. However that’s not true. There are opportunities for everyone to make a difference. Aidan Anderson was raised into a family that valued community service. One of his kind deeds blossomed into the nonprofit organization Aidan Cares. Ten years later, he continues to expand his impact. When he’s not working to help the community, Aidan enjoys singing and has released an album and single on iTunes. 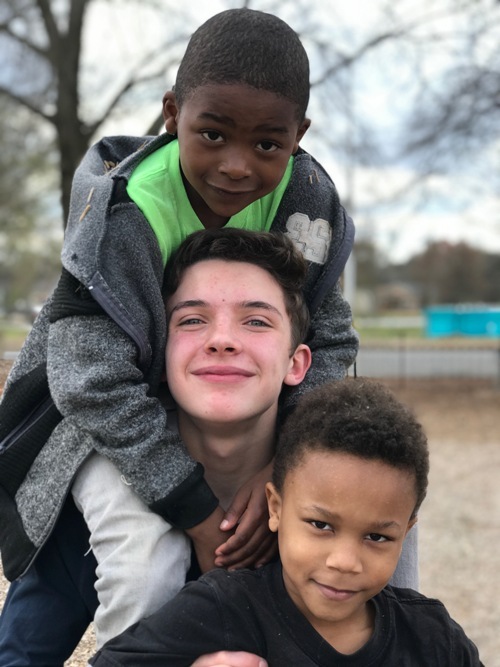 Keep reading to learn more about Aidan and his organization! From an early age, Aidan has enjoyed sharing his love of music with others. He was originally inspired to start Aidan Cares after he received $80 in tips for playing his harmonica and speaking at a restaurant because “it felt so right”. Aidan donated all the tips to buy 320 pills of parasite medication for children in Africa. Later on, he was offered an opportunity through his mom to play for a corporate launch event, which he accepted. The event helped raise a considerable amount of money, all donated to buy pills for children in Africa. And Aidan Cares was born. Since then, Aidan has given countless more performances to benefit kids around the world. Additionally, he has given multiple TEDx speeches, spoke at Stanford University, and was a speaker at the Girls and Boys Club of America, and more. He currently also serves as a block captain for needy children in Atlanta every Saturday. Aidan plays with kids from Adopt-a-Block. Aidan credits his mom to be his biggest inspiration for getting into community service. They delivered food and other supplies to the sick and homeless when he was less than two years old. Together, they’ve lived in nursing homes and penthouses when on a mission, but for his mom and him, the sacrifices are absolutely worth it. These firsthand experiences taught Aidan that age is only a number and that anyone can truly make a difference. And he is determined to share his experiences with other kids. Outside of Aidan’s family, Aidan feels the culture of giving is not as strong. He believes his charitable acts should not be regarded as something special and unique, and wishes that the culture of giving would become more mainstream. There are so many different ways to give. Aidan advises that everyone “find what they were born to do, find their own passions and then give from that place”. During many of his speeches, Aidan shares with audiences his story of giving. He shares the lessons he has learned from some of the people he has helped, including a young kid that thought Aidan to “embrace each day”. In between these important ideas, Aidan’s speeches are peppered with light jokes that showcase his personality. As for his career goal, Aidan dreams of being drafted into the NBA. But he knows for sure that he will continue his passion in community service even as he grows older. When it comes to giving, there are no boundaries. Anyone, young or old, rich or poor, can make a difference in another’s life. In the words of Aidan, “Living to give is life’s greatest answer.” Even the smallest efforts could make a world of change. This month, focus on working on helping others’ lives. Amazing Kids wishes Aidan the best on his future endeavors, whether it be in community service, music, or basketball!